Parrots by Margaret Fetty. 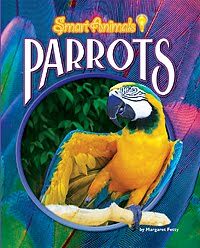 Part of the Smart Animals series published by Bearport. Available now. Do you have a parrot? If so, you already know that these animals are very smart. Many parrots can learn words and repeat them back to people. But some parrots actually use human words in sentences that have meaning. Also, scientists are discovering that parrots are also smart enough to make simple choices. Brilliant color photographs accompany the information. Back matter includes: Facts about parrots, glossary, a short bibliography, more to read, an online places to learn more about parrots, plus an Index. More Nonfiction Monday posts can be found at the Miss Rumphius Effect blog.